That is Heidi to you! "For Shizzle Rizzle, Dizzle ain't Da Bizcuits for Da Swizzle Mizzle Costume"
Translations - These are not the shoes for the Swiss Miss Costume. This photo was taken when Snoop Dogg came storming out of his dressing room while getting into costume for his Swiss Miss photo shoot (he already had his hair braided). 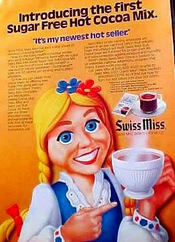 Apparently Swiss Miss has retained Snoop to help the the hot chocolate make inroads in the North American urban market, but the shoes they gave him were not "Swiss" enough. Who knew that Mr. Dogg was such a connoisseur of all things Swiss? Overheard - Now that is Customer Service! Customer: Do you have a washroom? Pizza Guy: Why? Do you want to wash your hands? If you do, you can use my sink, but if you want to take a leak, go on the street.